Jax Graham is a member of an elite military team, but when it comes to taking care of his four-year-old son after his ex-wife dies, he’s completely clueless. Family therapist Pickett Sessoms knows just how to help a rough, tough Navy SEAL deal with a scared and lonely little boy, but not if he insists on going it alone. 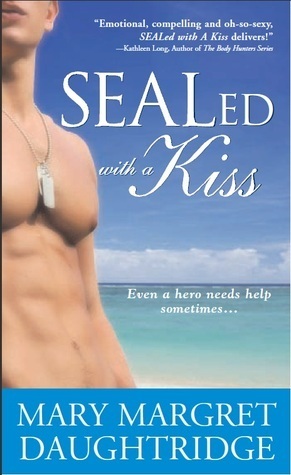 I took a chance on SEALed with a Kiss back when it first came out and ended up really enjoying it! Jax is completely out of his element when he finds himself with custody of his young son and to make matters worse, a hurricane has forced them to evacuate and he has no where to stay. In steps Pickett who was one of the first really independent heroines I read. I loved how she wasn’t afraid to take charge and she knew what she wanted in life. These two meet and fall in love under unusual circumstances but they have great chemistry together. Tyler was also absolutely adorable and I turned into mush as I watched Jax and Tyler bond as father and son. I’m a big sucker for single father books and this hit all the right notes. What book did you take a chance on and enjoy?